The leaves are turning, the air is crisp, and there’s no question that fall is here. That means the return of football, soccer, lacrosse, and other fall sports—and the injuries that accompany them. One of the most common sports injuries each fall is Achilles tendonitis, which can happen to any athlete who puts repeated stress on his or her Achilles tendon. In this blog, orthopedic foot and ankle surgeon, Stuart Katchis, M.D., will explain the injury, its symptoms and describe what treatment for Achilles tendonitis entails. 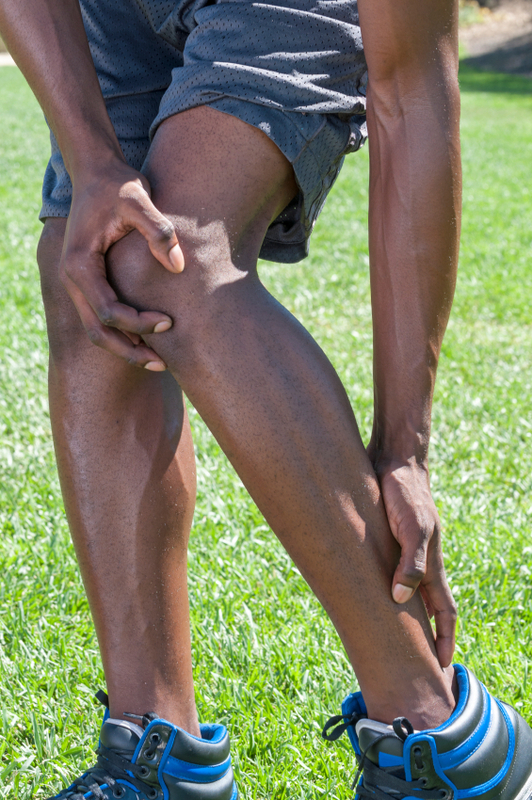 Like other medical issues ending in “-itis,” Achilles tendonitis is an inflammatory condition. It occurs when the Achilles tendon—the thick tendon leading from the base of the calf to the heel bone—becomes irritated and inflamed. This causes pain and stiffness and makes walking, running, or any other activity that involves the lower leg or foot uncomfortable. Like other types of tendonitis, Achilles tendonitis is a repetitive use/overuse injury. There are actually two types of Achilles tendonitis: insertional, which occurs at the heel, where the tendon attaches to (or “inserts”) the bone, and non-insertional, which occurs higher up, above the heel. With both types, you will probably experience pain in the back of your leg or above your heel. You are also likely to have stiffness, which may be worse in the morning or the day after exercising. The area may be more painful when you first get up or after being off your feet for an extended time. Swelling and general tenderness are also common, and in some cases you may have a raised bump where the tendon is most irritated. This is due to a physical thickening of the tendon in that area. Insertional Achilles tendonitis may have the added problem of bone spurs where the tendon attaches. Since it’s an overuse injury, immobilizing the injured foot may be helpful as well. Immobilization reduces stress on the tendon and allows it to heal. Shoe inserts which change the mechanics of the foot and/or leg (such as heel lifts) may also be used to reduce strain. Additionally, compression wraps may not only help reduce swelling, but can also help stabilize the tendon and reduce its movement, allowing healing to begin. Gastrocnemius recession: This procedure involves a small incision in the back of the leg through which the gastrocnemius—the large calf muscle—may be viewed. The tendon is released, and the muscle may be left to heal on its own or may be sutured into its new position. This treatment is usually used when the problem is caused by chronically tight calf muscles, when regular stretching has had no benefit and the patient still has trouble flexing his or her foot. Debridement and repair of the tendon: This treatment is used when there is significant damage to the tendon. The damaged area is surgically removed and the remaining tendon is surgically repaired. In especially severe cases, this may involve transferring tissue from another area to reinforce the tendon. Bone spur removal: Insertional Achilles tendonitis often causes bone spurs. If this is the case, surgery is required to remove the bone spurs, and anchors may be inserted to hold the tendon in place as it heals. While Achilles tendonitis can be a painful and frustrating injury to endure, the good news is that most cases can be effectively treated with conservative options. The earlier you seek treatment, the better. If you’re experiencing symptoms of Achilles tendonitis, schedule your consultation with Dr. Katchis and discuss your treatment options today. You can get started by filling out the schedule appointment form right on this page.